LEXINGTON, Ky. (Feb. 1, 2019) — University of Kentucky Student Services is now accepting applications for UK 101/201 peer instructors for the fall 2019 semester. The application is open Feb. 1 through Feb. 25. Peer instructors are current UK students who assist in the teaching of UK 101/201 courses. Peer Instructors serve as role models for new students, providing them with knowledge about what it is like to be a student at UK. 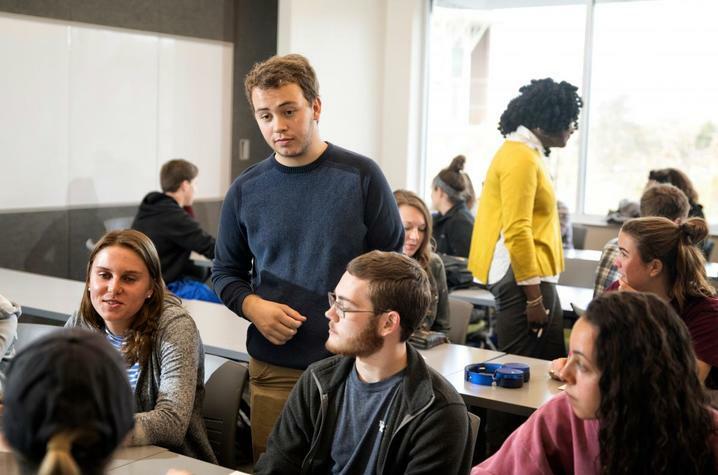 Essential to the UK 101/201 courses, peer instructors gain leadership and teaching opportunities, a network of more than 100 student leaders on campus and an outlet to contribute to students' academic success, said Marcia Shrout, director of special programs. Students who take the course often leave with a strong sense of belonging on campus, in part, due to the intimate size of the class and the materials presented throughout the course, but also because of the peer instructors' involvement in the course. Sarah Richlak, UK 201 peer instructor and program liaison, was inspired by her UK 101 peer instructor her freshman year. After her experience in the course, Richlak wanted to follow in her peer instructors' footsteps and make a difference in the lives of new students. "The most rewarding part about being a peer instructor is hands down the relationships that I get to build with my students, both during the semester that I work with them and after, when the pencils are down and the class concludes," Richlak said. "I have been able to create an incredible bond with multiple students from UK 101/201, and without the UK 101/201 program, I would not have had this incredible opportunity to both inspire and be inspired." With a mission to build a foundation of academic success, foster a sense of community and promote personal growth, UK 101/201 provides a plethora of benefits for new students across campus, but also proves to be rewarding for the peer instructors co-teaching the course. "UK 101 and UK 201 would not be as successful without our peer instructors," Shrout said. "Peer instructors serve as mentors to their students and help in their transition to college and the University of Kentucky. It is so helpful for new students to hear from a fellow Wildcat who has gone through the transition of being new to UK and who have been successful in that process." interacting with students during class and out of class activities. To learn more about the selection criteria, click here.